What It’s About: When a small private aircraft collides with a 747, it kills the crew but leaves the cockpit intact. Stewardess Nancy Pryor (Karen Black) must step up and fly the plane until her estranged boyfriend, Alan Murdock (Charlton Heston) is dropped into the aircraft by military helicopter so he can take over and land the plane. Why Watch it Today? : A similar, but far more tragic event occurred today in 1969 when a Piper Cub collided with a DC9, crashing both airplanes. 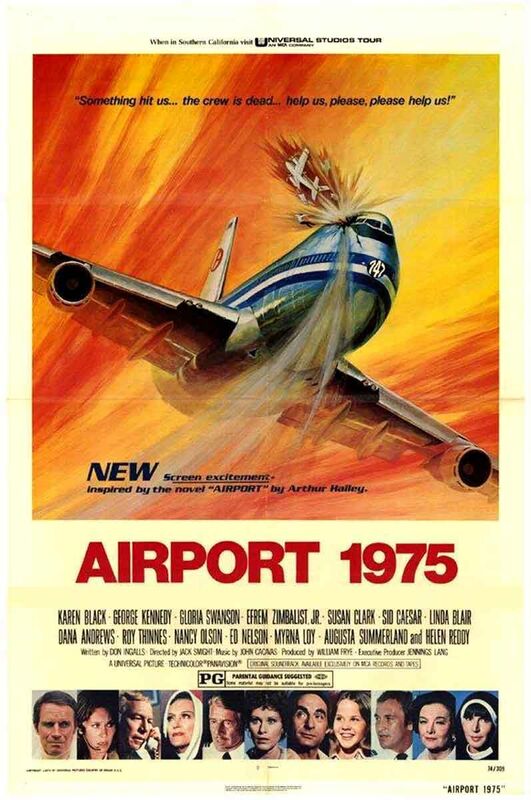 I can’t say for sure if that crash inspired this ludicrous film, but Airport 1975 is itself one of the big inspirations for Airplane! (the other being Zero Hour!, which starred Dana Andrews, who shows up here flying the private plane that crashes into the 747). Airport 1975 may, in fact, be the perfect so-bad-its-good airplane disaster movie, with ludicrous events (that aren’t as fantastic as Airport ’77 or The Concorde…Airport ’79), a star packed cast, silly dialog and characters, and decent effects and stunt work. This entry was posted in Adaptation, Airplanes, Based on a Book, Disaster, Event Film, Melodrama, Movie of the Day, Sequel, So-Bad-It's-Good and tagged "Can Anyone Fly a Plane? ", airplane, Arthur Hailey, Austin Stoker, Beverly Garland, Charlton Heston, children of famous people, Conrad Janis, Dana Andrews, Efrem Zimbalist Jr., Erik Estrada, George Kennedy, Gloria Swanson, Guy Stockwell, Helen Reddy, Jack Smight, Jerry Stiller, Karen Black, Kip Niven, Larry Storch, less famous siblings, Linda Blair, Linda Harrison, mid-air colision, musical interlude, Myrna Loy, Nancy Olsen, Norman Fell, Roy Thinnes, Sid Caesar, Universal Pictures.